Pilomatricoma is a common type of the skin tumor that is normally harmless. It is majorly a hair follicle tumor that can grow anywhere onto the body. Due to the nature of the tumor, it can grow very slowly and does not cause any type pain at the initial stages. Such type of tumor is quite common in children’s but it may have the same kind of effect onto the adults as well. Head and the neck region is the most common region where these tumors can develop. Such type of tumorous growth can change color at different stages. Sometimes these tumors can be purple in color. Pilomatricoma is a type of skin tumor that majorly involves hair matrix. In medical term it can be called as Malherbe calcifying epithelioma. Formerly, this particular tumor was called Pilomatrixoma. There are various characteristics that can identify the type of the tumor. In some cases these tumors are responsible for the growth of anucleate squamous cells. These cells can be called as the squamous cells as the shape and the size of the tumor can be smaller that can gradually grow. The reason behind these tumors are hair follicles that are normally present in high density around the neck and head region. There are number of symptoms that can identify that a tumor appearing onto the skin is Pilomatricoma. Mostly it is found these kinds of tumors are angular in shape. When it comes to the type of the tumor, these tumors are mostly hard; it is because of the fact that there is a calcification that can occur inside the tumor. These tumors normally don’t appear too quick, it can take a while to grow such type of the tumor. The color of the tumor is mostly red or sometime it can be purple as well. The diameter of such tumors can get up 5cm in size. It is hard to tell that what is the actual reason behind the Pilomatricoma but according to the latest research there two basic reasons for it. First one can be genetic predispsition, in some cases there is a gene called proto-oncogene. When the proto-oncogene gets involved in hyper activity, it can cause tumor to grow onto the skin. During the activity, the process of cell death is quite slow resulting in tumor. The second reason is the genetic diseases or other abnormality. There are genetic abnormalities found in different kind of genes. Due to the abnormal behavior of the genes, there are chances that the tumors can grow onto the skin. Pilomatricoma can be treated with the help of incision and curettement. There is a general practice used to remove the tumor. Excision is said to be one of the methods that is used to treat the tumor. The tumor usually disappears and that is the reason why excision is mostly preferred by the doctors. Once the tumor is cut out it should be ensured that the tumor is completely removed otherwise there are higher number of chances that the tumor might re-appear. 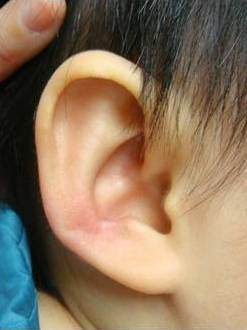 It is generally suggested that tumor should be removed immediately because it can grow within the dermis with a tail.